The piston (5) is moved by the electromagnetic field generated by the single wave diode rectified current flowing through the coil (4). Each current pulse moves the piston against the pressure spring (3). 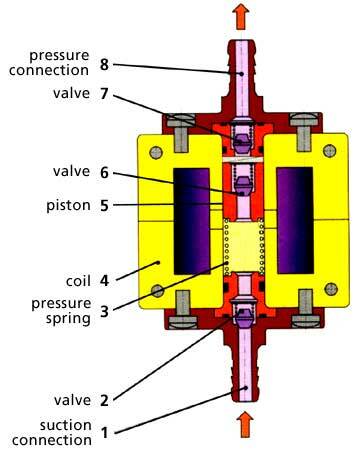 This movement by reducing the volume in the suction chamber opens the valve (6) set in the piston to let the liquid run into the pressure side. When the current pulse dies the pressure spring pushes back the piston toward the pressure side. The increase of pressure closes the piston valve and the liquid flows through the valves (7) set in the pressure connection (8) and into the pressure pipe. This movement creates a low pressure in the suction chamber which opens the valve (2) set in the suction connection (1). The liquid is sucked into the pump and the cycle starts again, 60 times per second (at 60 Hz). The piston size and the length of its displacement define the flow rate. The pressure limits itself automatically. The pump will run without damage when the liquid flow is stopped momentarily. The pumps are typically powered with 120 VAC or 24 VAC 50/60 HZ. Alternatively, for flow control, pulse width and frequency modulation drive circuits can be used. Precision components, piston solenoid operated pumps, and bushings guarantee minimum wear and long life. By offering many combinations of materials, our pumps will handle a broad range of media and temperatures.